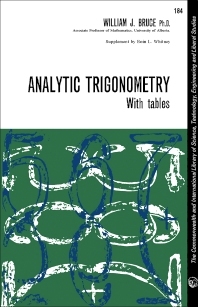 Analytic Trigonometry details the fundamental concepts and underlying principle of analytic geometry. The title aims to address the shortcomings in the instruction of trigonometry by considering basic theories of learning and pedagogy. The text first covers the essential elements from elementary algebra, plane geometry, and analytic geometry. Next, the selection tackles the trigonometric functions of angles in general, basic identities, and solutions of equations. The text also deals with the trigonometric functions of real numbers. The fifth chapter details the inverse trigonometric functions, while the sixth chapter covers the procedures for sketching graphs of trigonometric functions. The coverage of the selection also includes logarithm, solutions of triangles, polar coordinates, and complex numbers. The book will be of great use to both instructors and students of trigonometry.